This is great quality! Can’t wait to give it to my niece! The colors turned out to be perfect and will look great in the nursery! I ordered the bumpers separately so hoping they will be in soon! Turquoise and Coral Feather 4 Piece Crib Bedding set has all that your little bundle of joy will need. Let the little one in your home settle down to sleep in this incredible nursery set. 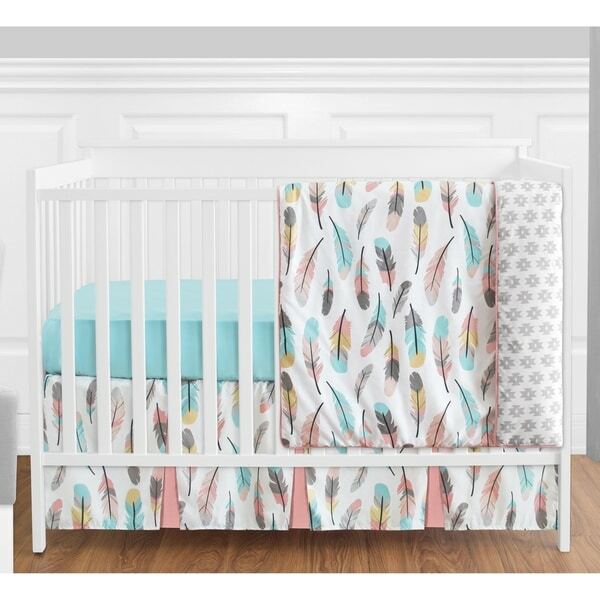 This baby girl bedding set features a multicolored feather print, a coordinating grey tribal geometric print, and solid turquoise and coral fabrics. This collection uses the stylish colors of coral, turquoise, grey, gold and white. The design uses brushed microfiber fabrics that are machine washable for easy care. This wonderful set will fit most standard cribs and toddler beds. Crib set includes: Crib Comforter, Fitted Sheet, Crib Skirt (Dust Ruffle), Diaper Stacker. I ordered this bedding on August 12 and received it on August 23 in TX. This bedding is beautiful. It’s very soft and true to color. I absolutely love it and I can’t wait to put it in the crib.